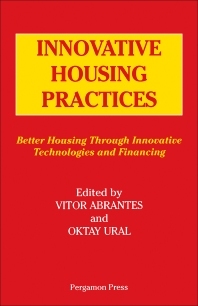 The 53 papers contained in this volume reflect the aims of the International Association for Housing Science which are to improve every phase of housing technology and production particularly through new urban planning, new designs, new materials, new technological and management developments and innovative financing. Emphasis is placed on the application of all these aspects to developing countries although there is much to interest professionals in the developed world. For architects, civil engineers, planners and urban environmentalists. Preface. Part 1: How Urban Regional Planning Can Reduce Housing Costs. Design quality in private redevelopment of urban neighborhoods, R A Casebier. Effective cost saving methods for buildings, K Dholakia & S Dave. Mass housing versus sites and services schemes for low income groups, N Kader. Infrastucture costs for roads and railways, R Krapfenbauer. Evaluation of low-income housing in the United States of America: a case study. Implications for future design, R Dorsey. Part 2: How New Designs Can Enhance the Quality and Cost Performance of Housing. Applications of fibre-glass reinforced plastics in building & construction industry, A K Asthana & N V R Rao. Confined masonry and concrete frame buildings structures - a cost comparison, H Sousa. Reducing housing costs: design and construction to prevent home moisture damage, L Gardner et al. Improving housing quality through thermal regulations, E Maldonado & E Oliveira Fernandes. New strategy of architectural programming for housing in developing regions, J Wlodarczyk. Part 3: How Innovative Constructions Can Reduce Housing Costs. Soil improvement techniques for housing development projects, M Durrani. Reducing costs through concrete quality control, M E Aroso & M H Aroso. Technology versus development, J Pulido Valente. Building defects in equatorial climate, S K Roy. The use of timber in self-help affordable housing, L Lewis. Part 4: How to Reduce Costs through Innovative Financing for the Builders, Consumers and Producers of the Materials. Public housing and the promotion of homeownership, B G Field. The use of generic cost/performance ratios in the financing of housing, J Moreira da Costa.